I am surprised that the whole peace deal was to eliminate OLF from the political radar. I was following eagerly that the political systems in Ethiopia is improving but in the wrong direction. Jawar’s calculation is wrong. Presiding OLF to Christianity and waging war on it by the eastern Ethiopian elites is not new. They created Islamic Oromia rebel group against OLF but never succeeded. They disintegrated beyond repair but OLF remained a strong rebel for decades. Air strike on civilians is not acceptable by any measure and it is a deal breaker for the Oromos. OLF shouldn’t disarm because this plot shouldn’t succeed. Instead they should control all Oromia before any election deal follows. Woyane’s control of the political and military system should end. The amhara brothers should wake up. Still TPLF is on power and is gaining more power by eradicating military opponents. Please wake-up, this is a TPLF government and not peoples’ government. They shouldn’t be trusted by any measure. Your comment reflects, ad nauseam, a political hysteria about TPLF, although it has absolutely no involvement in the crisis in Wolega. In the meantime Abiy and OLF may have accepted a truce to contain the situation. There is no evidence that TPLF is giving assistance to OLF, or that TPLF sees OLF as a partner in a strategic alliance… TPLF is not aggrieved by the transformation, but that a large part of the “transformation” has become a campaign of political hysteria and a witch-hunt against TPLF and the people of Tigray. That is TPLF’s primary concern… I believe the writer here is making some fraudulent statements about TPLF adding to the obsessive compulsive political disorder in Ethiopia. And that is pitiful. Today, OLF/ABO is stronger than it has ever been since its creation! Go visit Oromia and see it for your self. If it’s so weak and dead, why is OPDO going around arresting and killing Qeerroo throughout Oromia? Why not just wait for election and let the people decided who should lead them? The Qeerroo are the generation of Oromos born in the late 80th and early 90th, around the time the current Ethiopian government rose to power. The importance of the time of their birth is crucial because they are the first Oromo generation in over a century who had a defined home land “Oromia”. They are the first generation of Oromo’s that grew up with Afaan Oromo as the official language of Oromia and it being recognized officially by the Ethiopian government. These are the children that changed their Amharic names to Oromo names. They are the first generation of Oromo’s who grew up with no identity complex – unlike their older siblings, parents and grandparents. These children grew up with Oromo consciousness as the center of their Oromo identity vs. Ethiopianizm – the celebration and expansion of Amhara language, culture, religion, history, festival, and even naming of children. 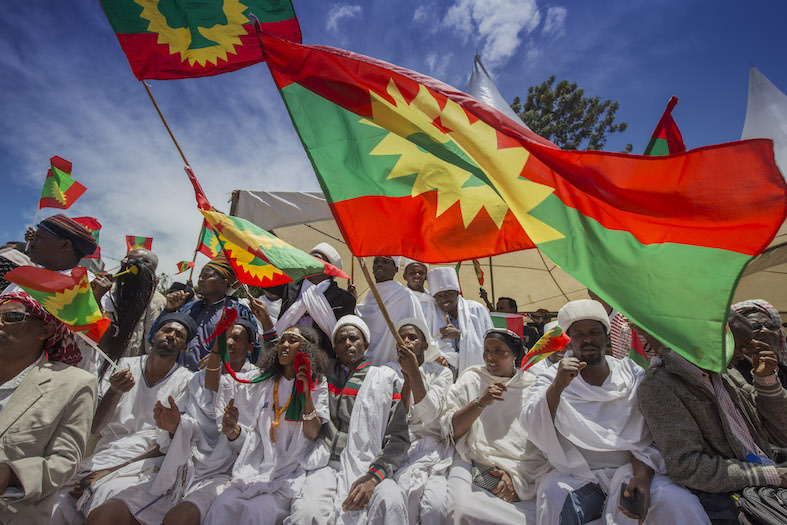 They are the seeds of Oromo consciousness planted by the Oromo Liberation Front (“OLF”) in its brief stance in Ethiopian government. They were educated in their own language and grow up celebrating traditional Oromo holidays. Unlike the generation before them, they are well educated in Oromo & Ethiopia history, they know the names of all the Oromo nationality and their work. They even celebrate New Year on the Gregorian calendar vs the Coptic calendar used in Ethiopia. To understand Qeerroo, all one has to do is follow their art, especially their music. The lyrics to their music, dance, and traditional closes in the music video will tell their state of mind and the level of Oromo consciousness. They are not demanding democracy, they are demanding freedom. Here are sample translated lyrics’ to their music “be mindful Qeerroo, when you lift the rock there is a snake under it, make sure to chop its head off”, “Unless you die, you will not be left in prison forever”, “we’re still here” and “only way to make the enemy bow is with a bullet”. Most of all, they understand the psychological control century of Ethiopianizem has over the older generation. The mental control Ethiopianizem has over the older generation of Oromo’s could be found in every walk of Oromo’s life, politics, religion, socio economic background. Century of Ethiopianizem has crated identity complex among the older generation of Oromo people and could be witnessed even within the same household. It could be seen by the reaction of the different Oromo generations to the reshuffling of political cabinet by TPLF. There were no Qeerroo’s congratulating an OPDO appointment to PM, on the other hand the older Ethiopianized Oromo’s are so quick to congratulate OPDO and clam victory. In closing….please go visit and study about the topics and people you are writing about. OLF is not an individual leader, it’s an ideology, that could not be distorted by Menelik II, Haile Selassie, Mengistu Hailemariam and Meles Zenawi. You are trying to tell us that the Oromo struggle is weaker today then in those times? What a fiasco! It’s rather a pity self-serving piece! Succinctly: Bragging! One of the mistakes that Oromo & Ethiopian activities made several times in Ethiopian politics is that they their personal feelings. I heard last four years that OLF is non-exist from our activities . I hope Mr. Jawar Mohamed adjusted himself after he went Ethiopia and listened what people think about OLF on ground. Mr. Abdu , before you preach us that OLF is dead 15 years ago ,please go visit all Oromia corner. Ethiopian regime has been telling us that OLF is their most enemy last 15 years ,but you are telling us different story. The OLF and Ethiopian government negotiation was handled by the former PM Hailemariam Desalegn. It seems he lacked the skill, it was more difficult for him to negotiate with the OLF than Ginbot Arbegnoch. He botched it. No written agreement for OLF to disarm. Just verbal. How many such agreements he made as a PM and Foreign Affairs Minister were total failures we may never know. Ahmedeen, thank you for your contributions. Please try and make accurate factual statements though. The public record says this was handled by the Foreign Minister Workneh Gebyehu and Oromia’s Chief Administrator Lemma Megersa. If you’ve info to the contrary, then please state it and the source of it. That helps to create and maintain constructive discussions. The dead are those demagogues who have been mentally enslaved and who have worked directly or indirectly against the interests of the Oromo to be the servants under their best dogs and leading their own life. However, the OLF will never die, instead it will inspire millions of young Oromos . Even if OLF is going to be driven out of the Ethiopian political arena by traitors and political conspiracy, there is no doubt that future generations will realize and respect their long-standing commitment to the precious and dedicated for Oromo liberty Where there are lies, the truth can be ignored immediately but the truth will be restored at any time! In the history of human kind, there is no nation left out under oppression and repression, no matter how strong and cruel the system was! Detained, killed and intimidated never stop fighting against the oppressors. One day, it turns out that the sun is rising for them and that their destiny can no longer be decided by others that prevents them from becoming a free nation! The cause of the Oromos would never be different from these nations; Although intimacy for the resilience of the Oromo nationalists is growing, Oromo will never be in this kind of situation in the years to come! I dream to see when the Oromos will defend their common national interest by one voice together from one corner to the other. selling the interests of the Oromo for their personal interests. Most importantly, the Orom nationalist will work hard to make their freedom comes true on the land of their fatherland-Oromiya! Through your posts , I have learned important facts particularl OLF’S missions and aspirations. My name is Tizita Belachew I’m a reporter for Voice of America. I wonder if like to participate in a radio discussion or even an in-depth analysis on OLF ? Please let me know if this is possible. My very best to you! I wish if all Oromo scholars and politicians come to the realization that, beyond personal and group interests and ideologies, we become united for transforming not Oromia alone, but also all of Ethiopia, even Africa. This great nation should be known for its great culture of democratic administrative system – Gadaa! This article has some truth in it but alas is mostly baised(says Daud’s soldier instead of OLF army to imply otherwise, the pundits are referenced but are not named etc) and very thin on evidence to back the pinions or assertions. Hyperbole is common to most commentators of Ethiopian politics but this writer has somehow managed to minimise.